Thoughts on Youtube's banning of Anthony Lawson's latest video, based on a vague complaint from an apparently nonexistent person. Today is as good a day as any to admit it: I am a holocaust denier. I deny that the US military's slaughter of two million Muslims as revenge for 9/11, funded by my family's and friends' and neighbors' tax dollars, constitutes a holocaust. 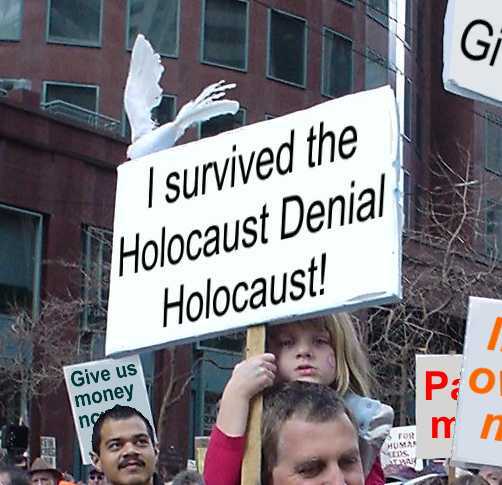 I deny that the Zionist genocide of Palestine constitutes a holocaust. I deny that the European settlers' genocide of tens of millions of Native Americans, perpetrated by some of my own ancestors, constitutes a holocaust. I deny that the mass murder of tens of millions of Africans in the New World slave trade, perpetrated by some of my own ancestors, constitutes a holocaust. I deny that the firebombings of German cities including Dresden, and the nuclear bombings of Hiroshima and Nagasaki, constitute holocausts. And I deny that the German murders of Gypsies, Slavs, handicapped people, communists, Jews, and others during World War II constitutes a holocaust. The root meaning of the word holocaust is "a religious sacrifice consumed by fire." There is nothing religious about the mass murders listed above, or the dozens of other similar episodes. God doesn't want us to mass-murder our fellow human beings. I deny that these and other stupid, evil mass murders have any religious significance whatsoever. I deny that histories of these mass murders are sacred in any way. I deny that any of these episodes of mass murder or genocide somehow justify other episodes of mass murder or genocide. I deny that the people who question historical details of any of these stories are heretics. I deny that they should be silenced or jailed. I guess that makes me a holocaust denier. So go ahead: Burn me at the stake. In the minds of witch-burners, there is something sacred about burning people at the stake. Especially people like me. What can you say about people like that? "Say to the unbelievers: I do not worship what you worship, and you do not worship what I worship. I do not worship what you worship. And you do not worship what I worship. To you your religion, and to me my religion." (Qur'an 109).